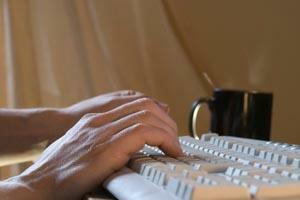 Is Freelance Home Writers a Scam? Learning how to recognize and avoid a freelance home writers scam is essential to developing a successful freelance writing business. As a freelance writer, it's important to be on the lookout for scam artists who are trying to take advantage of your desire to work from home. While there is no single sign that guarantees something is a scam, there are a few tricks you can use to identify when an opportunity may not be legitimate. The client wants an unpaid sample as part of the application process. Samples are occasionally needed when a job involves a specific and very detailed type of writing. In most cases, however, your previous work should speak for itself. Requesting unpaid samples is a common tactic scam artists use to obtain free content for their Web sites. You're asked to pay a fee for training or information access. Legitimate jobs don't require you to spend money for the privilege of working. Sites that claim to have job leads but refuse to allow you to see the opportunities until you pay are just a variation on this theme. The company makes inflated pay claims, such as stating that you can make $1,000 per week with no qualifications other than being a native English speaker. If a job is legitimate, it requires skills and experience. The company refuses to provide specific details about their compensation structure. This is very a dangerous warning sign if the agreement involves revenue share as part of the compensation. Revenue share agreements can be profitable under certain circumstances, but you need to understand what you are agreeing to before you start work. There is no contract. Whenever possible, you want written confirmation of your work agreement. You're asked to commit to several weeks or even months of work before you can expect a check. If you'll be writing five chapters of an e-book, for example, you should ask for one half the project fee as an upfront deposit. Otherwise, you run the risk of wasting your time and losing out on several hundred dollars of income. You've noticed that online forums are full of other writers who have had bad experiences with the same company. One person's bad experience doesn't necessarily mean a company is shady. When several people are claiming to have the same problem, however, it's a good indication that an opportunity might not be legitimate. The best defense against becoming a victim of a freelance home writers scam is to trust your instincts. If a deal sounds too good to be true, it probably is. Don't be afraid to walk away and wait for an opportunity that is better suited to advancing your freelance writing career.